Tetlow King Planning (TKP) secured permission for a controversial Bauhaus movement influenced Passive House in a highly constrained historic location in Hereford. 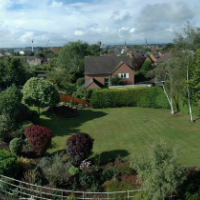 The site, which is located within a Conservation Area, consists of a mature garden that adjoins a Listed Building and is surrounded by four other properties. The site had planning permission dating back to 1999 for a traditional two storey dwelling, which was partially commenced in 2004, by the construction of a driveway. It was argued that the modern design approach was not at odds with the guidance in the National Planning Policy Framework and despite vigorous objections from neighbours, who instructed their own planning consultants to object, was approved by the Planning Committee of Herefordshire Council. The local objections stemmed from a strong opposition to the design approach, arguing that a more traditional house would also be capable of delivering energy efficiencies. However, TKP pointed out that the design was not only influenced by the work of the early modernist architects of the 20th Century, with particular reference to the Bauhaus movement and its characteristic use of clean lines, white render and flat roofs, but also by Passive House low energy design and contemporary modern architectural use of large expanses of glazing linking inside and out. At the Planning Committee Members agreed with TKP’s arguments that the overall energy efficiency, design credentials and the valid fall-back position were strong material considerations and that the proposal was not inappropriate for the constrained historic setting.